Detta inledningsavsnitt kommer snart att vara tillgänglig på svenska. 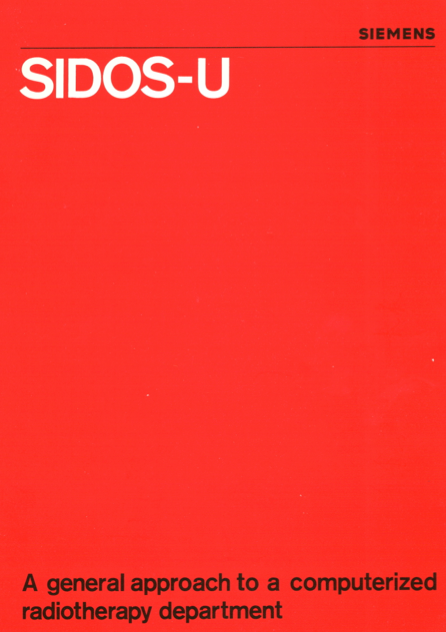 At the Annual Conference of the “Gesellschaft für medizinische Dokumentation und Statistik”, Werner Schneider presented 1967 his strategy for a stepwise introduction of computing power into hospitals of the Uppsala Hospital Region, the so-called Multi-Satellite System, MSS. This strategy allowed different divisions of a hospital to develop their proper applications on for these specifically adequate, hard- and software equipment. Participants from Siemens Medical industry, Erlangen, Germany, were very enthusiastic about this approach, due to the fact that Siemens was developing a variety of medical equipment for a variety of clinical medical areas with area specific needs for computerization. Somewhat later, Schneider was invited to present the MSS at an internal conference at Siemens in Erlangen, demonstrating how different laboratory divisions at the University Hospital of Uppsala ware planning R&D-projects for later implementation of advanced computing technology into their routine work. It became clear that there was a common interest in development projects in the fields of clinical physiology and radiotherapy. 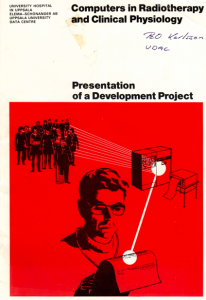 During the year of 1968, a development project was elaborated, covering specific areas in both fields. In order to facilitate collaboration between Siemens and the various groups involved from the part of Uppsala University, The Siemens owned Swedish company Elema-Schönander (later Siemens-Elema) created a special R&D-unit for this purpose. 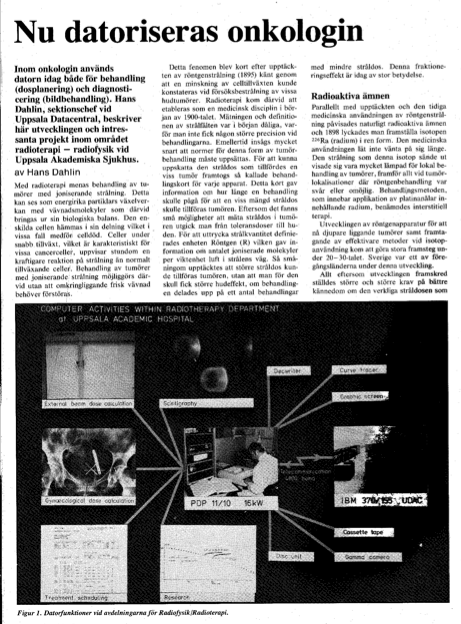 In January 1969, the Management Committee of the University Hospital in Uppsala (UAS) received a project proposal from Elema-Schönander and the University Datacenter (UDAC). 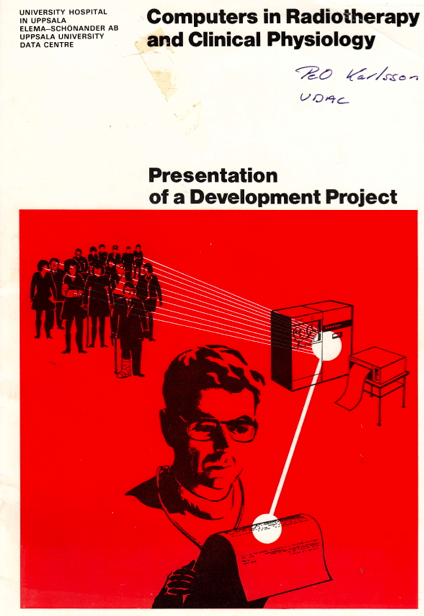 The proposal was accepted and the project started during the first quarter of 1969. It ended late 1972. In spite of the big success of SIDOS, Siemens became more and more reluctant to invest in an innovative, new version of this system. One of the reasons was the unsure future of radiotherapy in cancer treatment in the view of the very fast progress in chemotherapy. 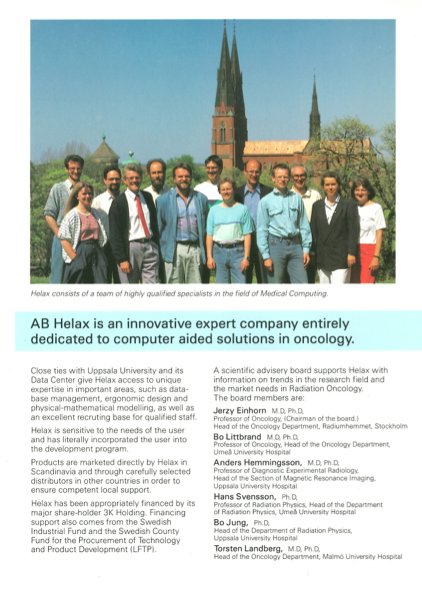 The UDAC manager of SIDOS, Hans Dahlin initiated therefore a project – involving all the leading people in the field of radiotherapy and adjacent areas in the Nordic countries – with the aim of establishing a specification of needs for future products in the field of radiotherapy. The research-sponsoring agency NORDFORSK agreed to sponsor this project. 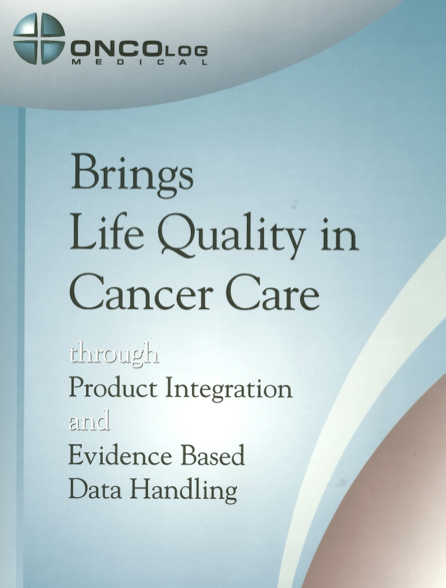 A main result of this unique Nordic collaboration was that several competence centers in all the Nordic countries formed together a R&D-project for realizing a number of prototype products as specified in this report: CART, Computer-Aided-Radiotherapy. One of the resulting prototypes, the Treatment-Planning-prototype developed by the Uppsala-group, was productified by HELAX AB, Uppsala.